Located in West Camel just a short drive from Yeovil and within a mile or so of the Haynes International Motor Museum. The hotel boasts an AA Rosette award-winning restaurant. 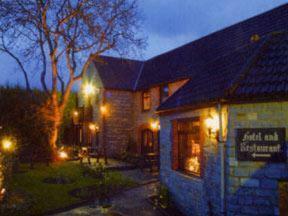 In a gorgeous, secluded location just a half mile from from the A303, this elegant family-run hotel has earned something of a reputation for it's first-class, quality food and lavishly decorated bedrooms. Although only a short drive from Sherborne, Yeovil and Wincanton, The Walnut Tree enjoys a private, rural setting in a gentle, serene environment. Full of traditional character and charm, with beautiful original features inside and out, the Walnut Tree hotel has 13 en suite rooms, each uniquely decorated with their own individual decor and character. Wireless broadband is available in all the guest rooms FREE of charge to guests. Diners can choose to eat in the bar area or in the à la carte restaurant, with its stunning wood-panelled walls and soft, romantic candlelight. For the last 3 years, the restaurant has received an AA Rosette award for the outstanding preparation of its food and the good quality of the fresh, local ingredients it uses.